Hit by sudden storm while working in shallow water on wreck of propeller COLORADO; loss of all 5 lives. 1883, Jun 4 Owned L. Sicken, Marine City, MI. 1884, Nov Owned Arthur Heminger; ashore Crawford's Quarry, Lake Huron, MI. 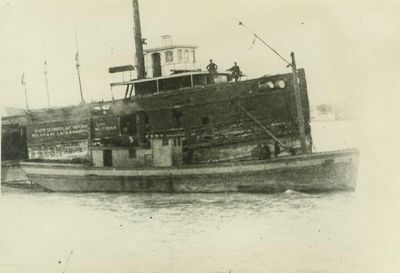 1894 Aground Eagle River Reef while salvaging. 1897, Sep 3 Collision with schooner PORTER while stationed at Cochester Light, working on sunken steamer GRAND TRAVERSE. 1899, May 29 Ashore, Thunder Bay Island, Lake Huron.